This charming country-style home exudes charm from the minute you pull up the front drive. Columns accent the welcoming front porch, while the side-entry garage naturally blends into the home's impressive facade. Inside, visitors are treated to an extended foyer with adjacent bedroom/study. Perfect for overnight guests, this room is complete with a walk-in closet and full bath. The remaining secondary bedrooms share a full bath and have their own closets. The great room features several custom features including a fireplace, cathedral ceiling and built-in niche. 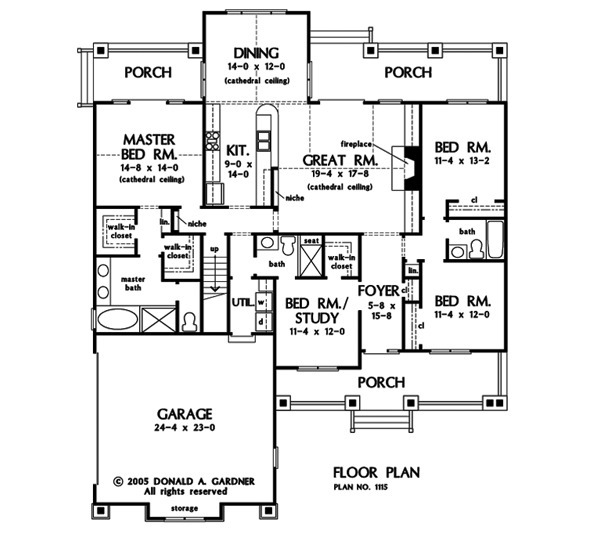 Open to the kitchen and accessing a rear porch, the great room naturally flows from one space to another. The master bedroom also accesses a second porch and a cathedral ceiling grants vertical volume. Two walk-in closets and twin vanities in the bathroom add luxury to the master suite. 1st Floor: 2051 Sq. Ft. 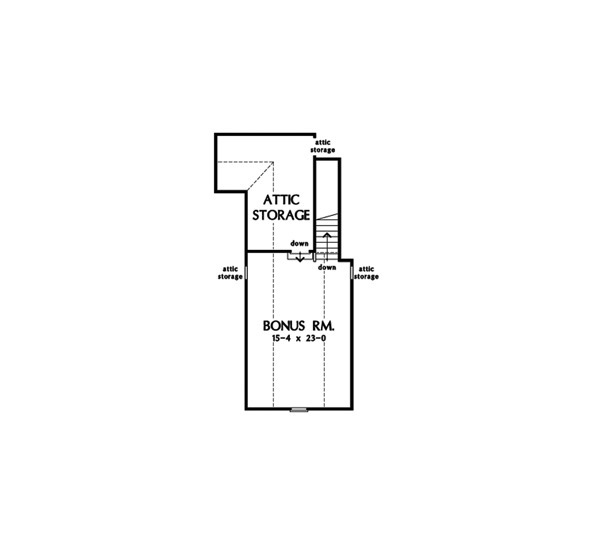 Bonus Room: 420 Sq. Ft.
Other Storage: 222 Sq. 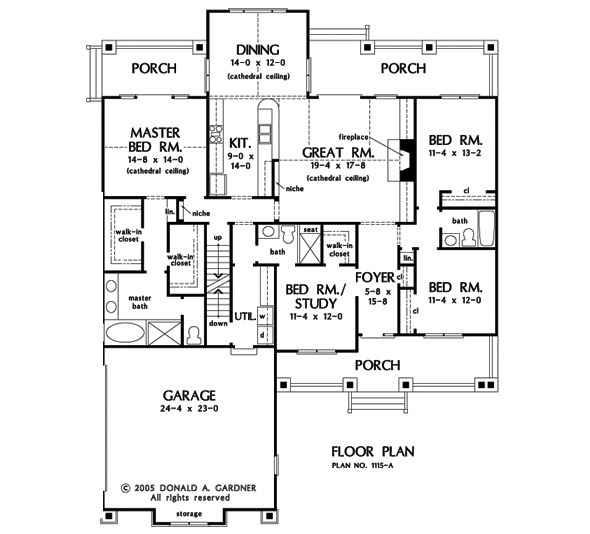 Ft.
House Dimensions: 56' 8" x 69' 8"
Great Room: 19' 4" x 17' 8"
Master Bedroom: 14' 8" x 14' 0"
Bedroom #4 : 11' 4" x 13' 2" x 9' 0"
Bedroom / Study : 11' 4" x 12' 0" x 9' 0"
Bonus Room : 15' 4" x 23' 0" x 9' 0"
Dining Room (Cathedral): 14' 0" x 12' 0" x 13' 10"
Foyer : 5' 8" x 15' 8" x 9' 0"
Great Room (Cathedral): 19' 4" x 17' 8" x 17' 8"
Kitchen : 9' 0" x 14' 0" x 9' 0"
Master Bedroom (Cathedral): 14' 8" x 14' 0" x 16' 0"
Porch - Rear : 27' 0" x 8' 0" x 9' 0"
Porch - Front : 31' 8" x 5' 8" x 9' 0"
Porch - Other #1 : 15' 0" x 8' 0" x 9' 0"
Storage (Other) : 9' 10" x 17' 0" x 9' 0"